C - Shortly after graduating from Emory University in 1990, an upper-middle class straight-A student named Chris McCandless made a resolute and perhaps rash choice to disappear into America. Without confiding in his family, McCandless destroyed his identification, signed his remaining college fund over to charity, abandoned his car in the desert, and burned what was left of his pocket money. Two years later, McCandless' remains were discovered in the Alaskan wilderness, where he had been sheltering in the abandoned shell of a bus and eventually died of starvation. Jon Krakauer meticulously reconstructed McCandless' journey in his book Into the Wild. Sean Penn has now adapted Krakauer's work into a film that is fitful, even clumsy at times. Fortunately, Penn's palpable passion for McCandless' story, and the penetrating, mythical structure he lends it, more than make up for his occasional directorial missteps. First the bad. This is the first of Penn's films that I've seen. Into the Wild demonstrates that he is an eager storyteller at heart, but perhaps not a natural within the medium of film. Experience will change this, I suspect, and it will be fascinating to see what sort of filmmaker Penn becomes as he hones his skills and sheds his more indulgent impulses. 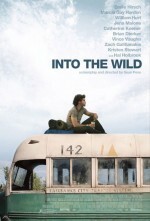 Into the Wild exhibits every stylistic flourish imaginable: slow-motion, voice-over narration, grainy flashbacks, extreme close-ups, stuttering edits, brightly superimposed text, and on and on. It's a flashy, shotgun approach to filmmaking. Intense artifice can be gratifying when it serves a story, but Penn applies these techniques sporadically and arbitrarily, such that they become distracting. There are touches of brilliance in Penn's script, such as early scenes that adeptly and believably convey the bourgeois tension in McCandless' family life, but overall it tends towards the clunky. The narration by Jena Malone as McCandless' sister rambles in a lyrical sort of way, but it's far easier to swallow than certain suspect lines of dialog. When Emile Hirsch as McCandless urgently intones an Oprah-ready platitude such as, "If you see something you want, you have to reach out and take it," I found myself uncertain of Penn's intentions. If this line is meant as a straightforward statement of the film's ethos, then it's painfully insipid. More generously, Penn may be counting on the viewer's lukewarm reaction to this ridiculous line in order to expose McCandless' inch-deep worldview. It's hard to say. These sorts of stumbles might have left another film in shambles, but Penn manages to overcome his own ungainly presentation, perhaps stunningly so. The bedrock of Into the Wild is its story, and it is an undeniably compelling tale whatever one may think of McCandless' morals or common sense. What American—especially a college-educated young man—doesn't dream of discarding the obligations and injustices of modern society and returning to a simpler existence? It is telling that Penn patiently waited ten years for the McCandless family to warm to the notion of this film. Penn's spirited, cunning stroke is to stage Into the Wild not as a sweeping biopic, or even a cut-and-dried dramatization, but as a kind of Hero's Journey. It is the rare film in which the "Inspired by True Events" tag seems perfectly appropriate, given the legendary quality to Penn's approach. The film cuts between two timelines, one beginning at McCandless' graduation just before his break with his old life, the other a year and a half into his journey just as he sets into the Alaskan wilderness alone. Unlike some of the film's more gratuitous touches, these interwoven timelines are crucial. Penn seems to recognize the tedium and despair that would drag down the second half of the film were it told chronologically. As McCandless' efforts to sustain himself in the wilds unravel, the story of how he came to this fate unfolds on a parallel track. Just as McCandless dwells on the memories of his journey and the lessons they offer, the viewer is offered context and insight. McCandless romanticizes his withdrawal from society as an intensely private endeavor in the tradition of Henry Thoreau or Jack London. Penn ingeniously approaches McCandless' journey—and its consequences—as a moral lesson for public consumption. I find it inexplicable that some viewers have found the portrayal of McCandless as ambiguous, or even hagiographic. If the ham-fisted bits of dialogue are frustrating, it is only because the message is blazingly clear for most of the film. McCandless' death could have been portrayed as a martyrdom, but Penn aims for something more pointed. He is recovering the young man's belated revelations for those of us who still languish in civilization, and these revelations indict the very impulses that drove McCandless north. As McCandless ambles towards his fate, he meets a succession of challenges and fellow travelers. Penn is not building a story around half-baked Joseph Campbell principles, but striving to understand a distinctly American tragedy through a timeless framework. Tellingly, title cards introduce the pre-Alaska phases of McCandless' quest as life stages. The traveler meets a pair of aging hippies (Catherine Keener and Brian Dierker), a gregarious wheat farmer (Vince Vaughn), a crusty widower (Hal Holbrook), and other assorted characters. Each offers some wisdom, receives insight from McCandless in turn, and highlights the fundamental paradox of him. McCandless talks condescendingly of the morality of solitude, but he seems most content in the company of others. He is confronted with monsters—ranger patrols, railroad bulls, raging rivers, grizzly bears—but the final demon is, of course, the demon within. Some of the strong reaction to Into the Wild seems to stem from the viewer's assessment of McCandless himself. Was he a noble dreamer or a feckless nitwit? Such questions were first raised in Krakauer's book, and a stale dramatization might have courted faux controversy by rehashing them. Yet given Penn's wholly original approach, criticism of the sympathetic treatment of McCandless seems misguided. The film is hardly a canonization, as his foolishness, self-absorption, and lack of preparation are not glossed. And still he is somewhat sympathetic, for although he was not a hero, he is this story's Hero. Emile Hirsch plays McCandless with genuine warmth and a touch of dimwitted arrogance, but generally keeps the performance inscrutable. Hirsch and Penn seem to recognize that he must be something of a cipher. As in all legends, he is a proxy for the viewer. Penn deserves criticism for engaging in the slapdash glitz one might expect in a student's first film, not the fourth feature from a veteran actor. Yet Penn also deserves credit for crafting a stirring and imaginative work from a tragedy that might have otherwise have been senseless. For me, the latter overcame the former.